For the last few weeks I have been feeling down - both physically and mentally. This e-zine was particularly challenging to write this month as I asked myself, 'how do I share healthy information when I am not feeling healthy?'. And then I was reminded that perhaps this is the best time to share - to be open and share with you how I worked through this time. Why did I get down? Well the big answer is that it is natural to sometimes have down cycles, especially when the seasons are changing. The more detailed answer is that I spent a weekend away in a hotel that was filthy and during which I got very little sleep. So here, in a nutshell, are the things I did to help myself as much as I could during these last weeks - I thought perhaps sharing this may help you or anyone you know that is also feeling less than the best. REST: Like most of you, I still had things to keep up with even when I was not feeling well, but it is essential to re-arrange things so you can rest. Coffee Enemas: I did a coffee enema every day for 5 days which helps your body in releasing congestion and blockages. I use a simple enema bucket for this. Juices: Green juices, herbal teas, good quality water, cough/sore throat drink (see recipe below). Neti Pot: This isn't something that works too well for me but I mention it as it is a very valued and proven technique that has been around for ages. My husband finds this to be one of the best remedies! You can read more about and purchase a neti pot, here. Hot Water Bottle: Oh so comforting to be warm and cozy!! Vapour Rub: Breathe in the aromas from the essential oils as you rest. I make my own by mixing camphor, eucalyptus and rosemary essential oils into olive oil. Hot Bath: I am always amazed at how much this can lift one up, both physically and mentally. I added in epsom salts, baking soda, rosemary essential oil and rose petals. Food: I ate very little and only things that are very easy to digest. Avoid completely wheat, dairy and processed/refined junk foods. Sunshine: Every day, if only for a few minutes, I sat my body under the sun. And probably the most important thing of all - just ride it through. Know that it will pass. There are many other helpful tips and tricks to getting through a time like this - read more about cold and flu remedies, here. Speaking of not feeling well, many of us will get sick at the time when the seasons are changing. And this is because when the seasons change is a natural time of cleansing and often, sickness is your body's way of cleansing. You can greatly assist your body by doing a cleansing fast or detox cleanse during the changing of the seasons. One of my favourite ways to do this is to do a 7 day cleanse. Don't want to do 7 days? 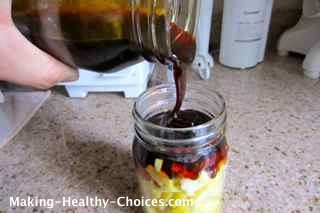 Then do a nice weekend of cleansing where you only ingest fresh juices. You will be amazed at the benefits you will feel by giving your digestive system a much deserved rest! The benefits of fasting to your long-term and overall health are incredible. To read more about why and exactly how to do a cleanse, click here. In keeping with the theme of this e-zine, here is the drink that I made over the last weeks when I wasn't feeling well. I drank this several times a day and found it to be extremely soothing to my sore throat and cough. Because it is a hot drink it also kept me cozy warm. So simple to make and delicious to drink! Another thing I drank over these past weeks was herbal tea and herbal infused water. Such a great way to get the medicinal and nutritional properties of herbs into your body. I found this wonderful (and inexpensive) product that makes this so easy! 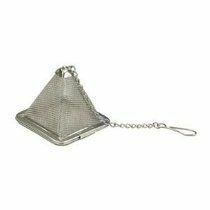 With this stainless steel pyramid tea infuser you can easily make a single cup of herbal tea. Simply place the herbs you want to use inside the pyramid. Put the pyramid into your mug and fill with hot water. 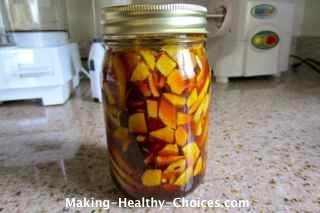 Another great way to use this is to make herbal infused water to drink while on the go. 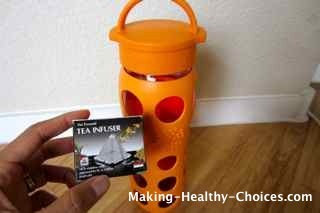 After filling the pyramid infuser with the herbs of your choice, put the pyramid inside your bottle and fill with water. Now you can sip of herbal water all day long. This pyramid infuser fits perfectly inside the 22oz glass drinking bottle pictured above. Such a great little tool to have in your kitchen!